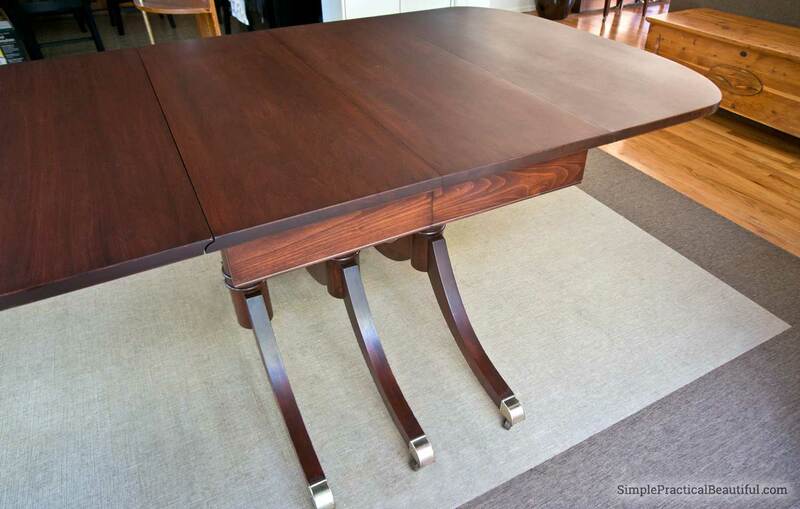 After restoring our vintage mid-century dining table, I loved how the brass-tipped legs looked. They were beautiful and shiny, like jewelry for our dining room. 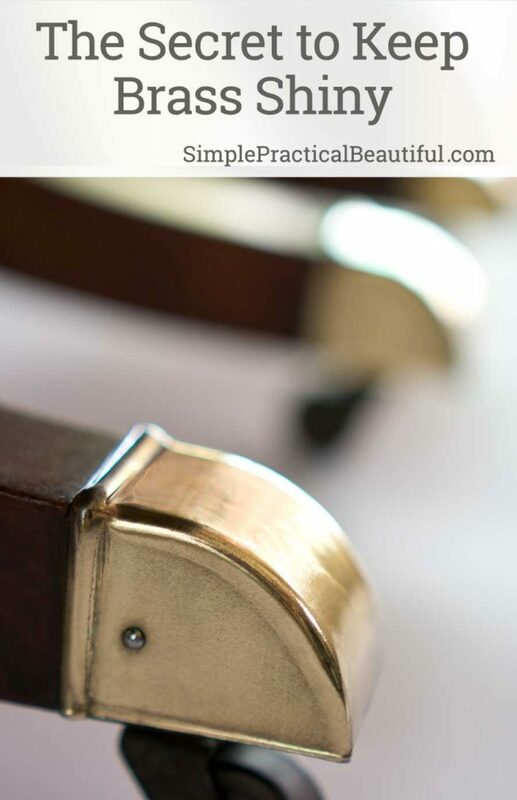 The mahogany wood grain is gorgeous, but those brass tips were what your eyes noticed first. Unfortunately, that shine lasted less than a month. Years ago, my mom had a beautiful brass garden stool that looked perfect in her bedroom. She loved it, but she had to polish it every few weeks to keep it shiny. Unpolished brass is mottled, brown, and ugly. But she was a busy mom of four and didn’t have time to keep the beautiful brass stool polished. So sadly, she spray painted it turquoise. If only she has known about Everbrite. I found Everbrite Coatings a few months ago, and their product description gave me hope for my brass table legs because I don’t have time to polish every few weeks either. I contacted Everbrite, and they sent me a sample of their polishing kit in exchange for sharing my experience with you. And I honestly have to say that I am amazed at how well Everbrite keeps brass shiny and how easy it was to apply. (You’ll need to purchase Denatured Alcohol at a hardware store; it doesn’t ship. Everbrite and ProtectaClear are both protective coatings from the same company. ProtectaClear is more durable for surfaces like sinks and countertops. If you want to know which would be best for you, take a look at the comparison on the Everbrite website. So you do have to polish the brass one last time. Get it as shiny as you possibly can. I used Maas Metal Polish, and it actually cleaned up the tarnish more quickly than when I first restored the table. Probably because Maas is a better polish and it’s only been 6 months since I last polished the brass, instead of decades. Like most polish, I rubbed it on with a soft, dry cloth, and then rubbed it off again before it dried, taking the tarnish off with it. 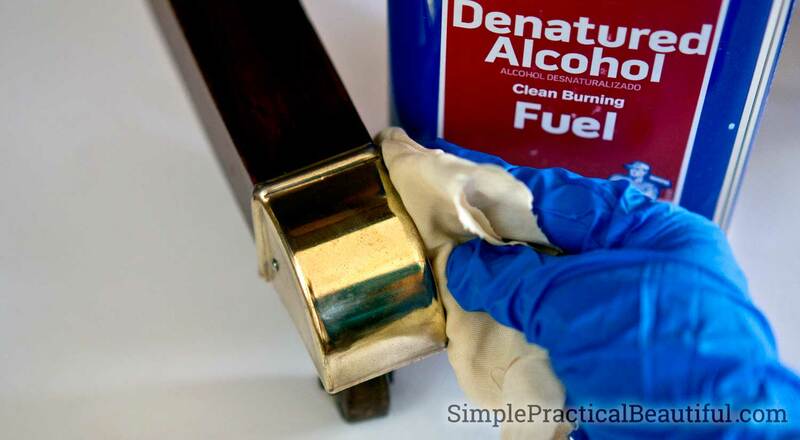 Rub and repeat until all the tarnish is gone, then buff it with a clean cloth to make the brass shiny. I have to add that I wish I could have gotten my brass tips smooth and even shinier (especially for their close-up pictures here), but those tiny marks you see are dents and scratches plus the texture of the original brass. 60+ years of being stepped on, kicked, bumped by chairs, and worse has taken it’s toll. Oh well, it adds character, right? And the brass is still beautiful all shined up. Use EZ-PREP Concentrated Cleaner and Neutralizer to neutralize any acids. Dilute the cleaner with water and wash off the polished brass. I just wiped down my brass tips with a wet rag dipped in the solution. Then rinse off the brass with clean water. 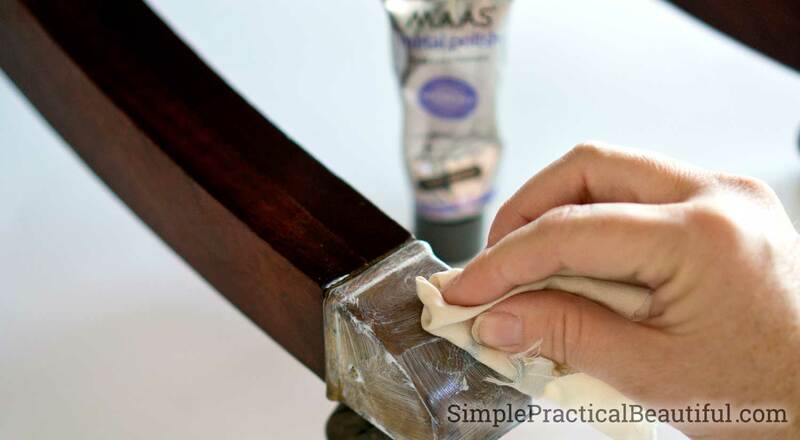 Actually, Maas polish doesn’t have any acids, so this step isn’t necessary after polishing with Maas Metal Polish. It is necessary with most polishes, so I included it here. Just before applying the Everbrite coating, wipe off the brass with denatured alcohol. This will clean off any residue that might prevent the coating from adhering to the brass. 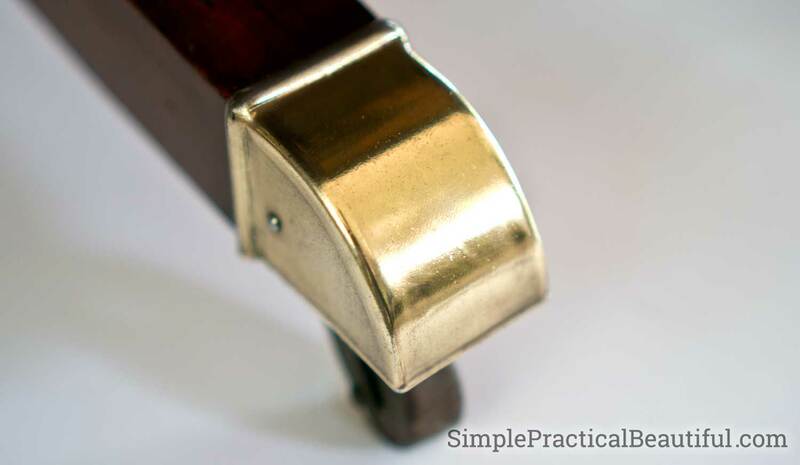 This step was really easy and just took a few seconds to wipe down each brass tip. Make sure you do this in a well-ventilated area. The denatured alcohol is pretty smelly and the Everbrite coating is even worse. I used a cotton pad to apply the Everbrite Clear Protective Coating, but you can also use a brush, sprayer, or cloth to apply it too. It reminded me of clear nail polish. It’s easy to apply because it’s self-leveling, so any application marks evened out. 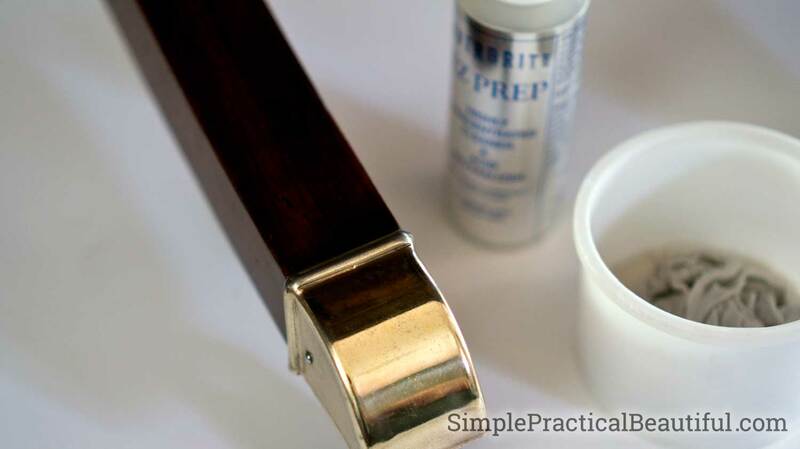 I applied 2 coats to protect my brass-tipped legs, waiting an hour between coats. There are a lot more detailed instructions and safety procedures included with the product that I didn’t include in this post. Make sure to read and follow all of the directions. I’m always skeptical of a new product, so I came up with a test to see how well Everbrite kept the brass shiny. Each side of my table has three legs, so three brass tips. On one side, I polished all three tips, but only coated one of them with Everbrite. The other two I let tarnish. Six weeks later, I repolished one of the uncoated tips and coated it. This way I could compare brass coated over a month ago with brass coated just today and brass that’s left to tarnish. The left tip has tarnished without any Everbrite coating. The center tip was newly polished and coated, so it looks shiny and beautiful. And the right tip hasn’t been polished for more than a month, but it looks just as shiny as the newly polished tip. So I’m convinced. 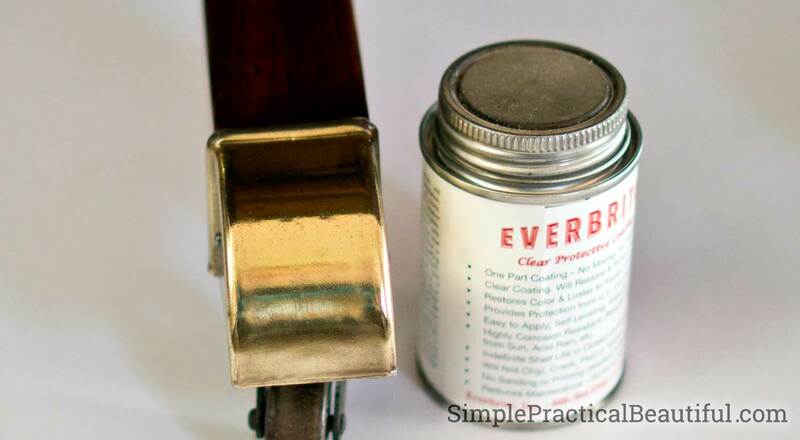 Everbrite keeps brass shiny so you never have to polish it again. My mid-century table with it’s brass-tipped legs is back to looking new again, and I don’t have to do any maintenance to keep it that way anymore. A very good product Rebecca. I think that the acidity does have to be neutralized otherwise you end up with the same mess all over again. I was looking at my copper pots the other day and thinking that even the lemon and salt solution may not be permanent. Thanks for this great tip. That table is gorgeous!! Thank you, Mary. I love the table too, and I’m glad I found something so I don’t have to keep polishing those legs. I’m so glad this helps you, Michelle! I really hope they ship to South Africa. It’s so much easier than polishing every few months.